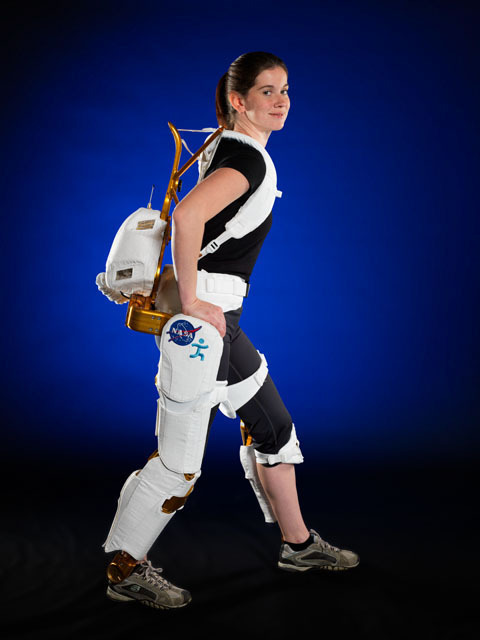 Project Engineer Shelley Rea demonstrates the X1 Robotic Exoskeleton (Credits: NASA/Robert Markowitz). Marvel Comic’s fictional superhero, Ironman, uses a powered armor suit that allows him superhuman strength. While NASA’s X1 robotic exoskeleton can’t do what you see in the movies, the latest robotic, space technology, spinoff derived from NASA’s Robonaut 2 project may someday help astronauts stay healthier in space with the added benefit of assisting paraplegics in walking here on Earth. Worn over the legs with a harness that reaches up the back and around the shoulders, X1 has 10 degrees of freedom, or joints — four motorized joints at the hips and the knees, and six passive joints that allow for sidestepping, turning and pointing, and flexing a foot. There also are multiple adjustment points, allowing the X1 to be used in many different ways. 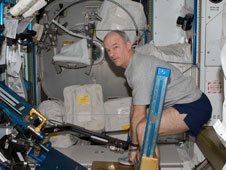 NASA astronaut Jeffrey Williams, Expedition 22 commander, exercises using the Advanced Resistive Exercise Device (ARED) in the Tranquility node of the International Space Station. Robotic suits could provide an alternative resistive exercise (Credits: NASA). Designed in only a few years, X1 came from technology developed for Robonaut 2 and IHMC’s Mina exoskeleton. NASA’s Game Changing Development Program, part of NASA’s Space Technology Program, funds the X1 work. NASA’s Space Technology Program focuses on maturing advanced space technologies that may lead to entirely new approaches for space missions and solutions to significant national needs.